Why are they called Doilies? 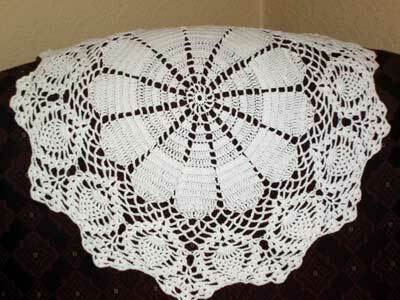 But where did the word “doily” come from? According to the BBC’s magazine “Homes and Antiques”, the name originated “from the surname “Doily”, a London firm of linen merchants who made fringed napkins in the 1700’s. From 1711 a doily was a small ornamental napkin used at dessert”. Over the years it evolved into other uses. Doilies are still useful today. They protect table tops from scratches that occur when moving things around or damage from wet glasses. Many people treat all wood furniture as though it was encased in plastic as so much furniture is made today. Of course anyone who owns antiques knows you can’t do this. I personally like doilies because their typically light colors break up the plain, often dark, surfaces of antique furniture.